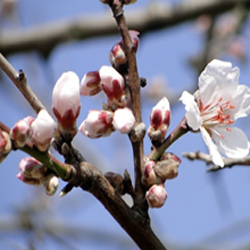 We collect pollen from several varieties of Almond trees. Fritz, Aldridge, Wood Colony, and Padre. The alleles are all 100% compatible with Non-Parial. We process our anthers to be disease free. Our process keeps the anthers from bruising and insures the highest viability. We also have our pollen independently tested. We mix the Almond Pollen with “Sure-set” for dry application. A custom blower is mounted on the back of a quad. Several hundred acres a day can be covered. This process is generally applied twice during peak bloom (40%-100%). Typically between 11am – 4pm. We also apply electrostatically using “Bloom-Set”, a suspension media which you use with an “electroblast” or an “on target” sprayer. Almond pollen can also be used with Bee-hive inserts. The pollen is can be dusted on the porch of your beehives using “inserts” that keep the bees from sweeping the pollen off their porch and coating themselves with pollen as they exit the hive. Apply during the between 10am-4pm as weather allows and bees are active. Typically you apply the pollen over a three day period. Good weather and strong bee activity are required. Pollen is applied when bloom is 40%-100% open flowers.